Perfect for your EDC or a day pack, the Summit Backpack is lightweight and compact. The large main compartment houses a hydration bladder sleeve with zippered and touch-fastener closure pockets, as well as a covered hydrator hose porthole (hydration bladder sold separately). An admin organizer is built in to the secondary compartment which has an external offset zippered pocket. Dual mesh water bottle holders are built in on the sides and have a PVC-lined bottom to keep you dry even when your bottles sweat. An integrated X-style shock cord near the bottom of the bag is perfect for shedding a layer or strapping gear in while the Y-style compression strap helps you secure your load. The adjustable shoulder straps are contoured and equipped with a removable sternum strap. 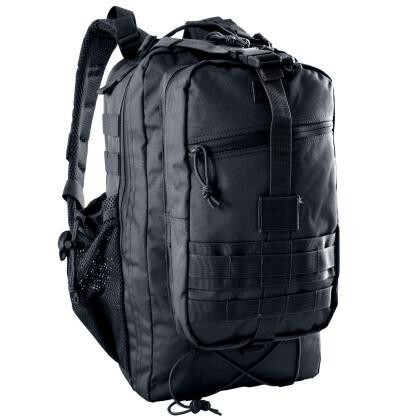 MOLLE webbing on the front and on either side allow for expansion and customization of this 23 liter compact tactical backpack.